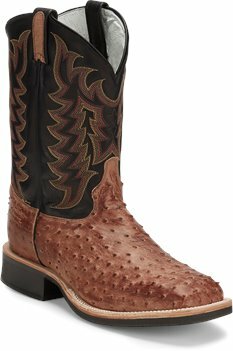 The Chadron Black 11-inch tall Cowboy Crepe® Men's western boot features a classic black leather upper accented by a traditional yellow and red stitching. 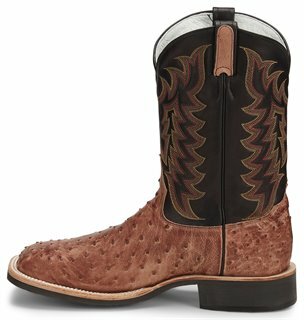 The golden brown full quill ostrich vamp is slightly distressed for a vintage feel and the square toe allows for a relaxed fit. The Lama Comfort Technology® insoles combine flexibility, stability, and cushioning for maximum comfort and its double stitch welt provides durability. The rubber outsole is oil and slip-resisting featuring a distinctive horseshoe pattern for added traction. This style is proudly Handcrafted in the USA with imported materials.